The Tian Shan bisect in its entirety XINJIANG, China’s westernmost province, since the mountains extend from the SILK ROAD oasis of Hami in the east to KAZAKHSTAN and KYRGYZSTAN in the west. The total length of the Tian Shan is about 1,500 mi (2,400 km); two-thirds of the range is within China. The JUNGGAR BASIN and the temperate Gurbantunggut desert lie north of the range, while the TARIM BASIN and the warmer Taklimakan desert lie south of the Tian Shan. Rising above both deserts, the Tian Shan forms a wet and green insular world covered with spruce forests. Alpine meadows and fertile GRASSLANDS support traditional pastoral nomadism in areas between 5,400 and 7,400 ft (1,800 and 2,800 m). The snow-clad Tian Shan feeds majors rivers that allow intensive agriculture, like the Ili, Aqsu, Tarim, and Konqi rivers. From 1929 to 1930, the Sino-Swedish expedition to the northwestern provinces of China mapped the eastern and northern Tian Shan. Understanding the geological history of this part of Xinjiang was the major objective of the expedition. Soviet earth scientists began surveying the western Tian Shan in the 1930s. They discovered the highest peak (24,406 ft or 7439 m) in 1943, and named it Pik Pobeda (“Victory Peak”). During the 1950s, geographers, hydrologists, glaciologists, and geomorphologists from the Soviet Union and the People’s Republic of China worked together. Concerns for seismic activities, deforestation, and water management eventually resulted in the detailed survey of the area. Originally called “Dihua shi” (“the Progressive City”) in Chinese, Urumqi was founded in 1760 by the Qing dynasty (1644 to 1912). 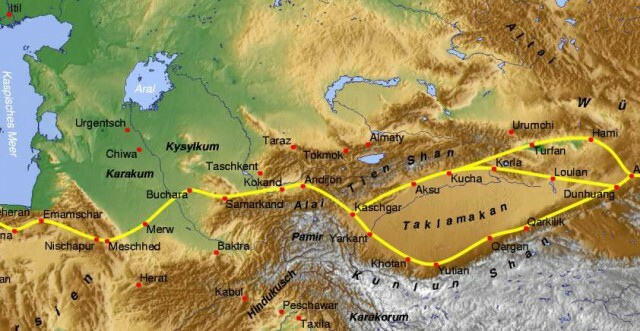 Beijing wanted to control the only road that connects the Tarim and Junggar basins through the Tian Shan. The walled city was located at 2,760 ft (920 m) on the northern piedmont of the range. In 1884, Urumqi became the capital of Xinjiang (“the New Frontier”) province, which was renamed the Xinjiang Uygur Autonomous region in 1956. The city is today a large metropolis as well as an industrial center. Since 1950, continuous immigration from inner China has displaced the Uygur native population.